I recently decided to try to solve all of the Expert Unblock Me puzzles. After solving around 20 or so puzzles, I realized that I did not have the time to solve them all 1. I didn’t want to simply give up since I had just started the challenge, so I decided to modify my original goal. Instead of swiping myself through the remaining nearly 800 puzzles, I would just write a program to find solutions for me. By doing this, I will have basically solved all of them. 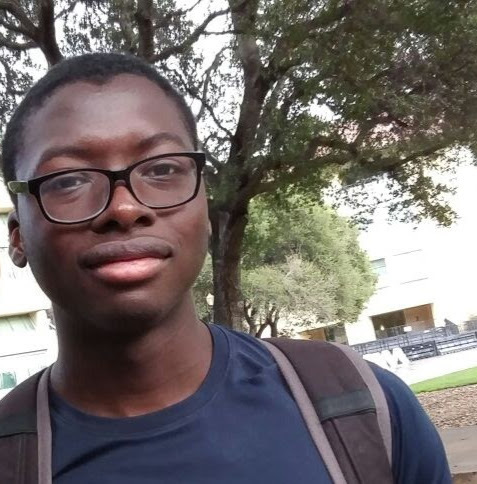 My plan was to find solutions to the puzzle using a standard graph traversal algorithm like A* 2. The program would keep track of several potential solutions to a puzzle at once, and explore the ones that look the most promising. Using A* as opposed to something like depth-first search would guarantee that the solution found in the end was optimal without being much more complicated to implement, so it seemed like an obvious search. Before I started writing the program, I needed to get some puzzles that I could test it on. I figured the puzzle were probably available online somewhere, so my plan was to just download all of them. 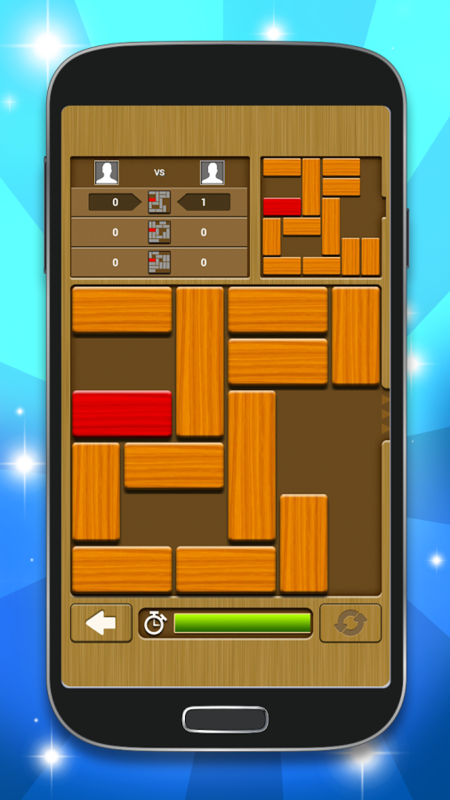 After a quick google search, I learned that you couldn’t simply download all Unblock Me puzzles 3; they just weren’t available. Unblock Me isn’t an extremely complicated game, so I could always have just made my own puzzles, but that sounded like a lot of work, so I need to think of something else. Thankfully, I wasn’t the first person to write a program like this, so I decided to see what my predecessors had done. In most of the examples I saw, the creator had made their own project, but one person had his program load puzzles in from images. This sounded promising. A quick glance of the blog post by the guy who loaded puzzles from images revealed that his implementation only worked on screenshots from his iPhone 4. In his program, he had hardcoded the locations of the tile centers, and so could look at the pixels at these locations to figure where all the blocks were, and where there was just empty space. I didn’t like that this approach was restricted to images from a specific source, so I decided to come up with my own method for constructing puzzles from images. The basic idea is simple. First, the program figures out what region of the image the game takes place in 5. It then crops the image to just that region and resizes it to be 600 x 600. At this point, all that’s left is the part of the image that matters, so since we know what size the picture is, we can hard code the potential locations of tiles and boarders. At this point, the program samples the pixels where the tile centers and tile boarders could be to determine the layout of the puzzle. By first detecting the region of the image where the game lies, the program is able to load puzzles from image less nice than screenshots. Left: The original image. Right: The game region detected. Left: The image after being cropped and resized. Right: The points the program uses to check for tiles and boarders. The most interesting part of detecting a puzzle in an image, is the first step. This is done in a bit of an ad hoc manner, and so is still not perfect 6. The program assumes the correct region is located in a square in the image, and so tries to find its top-left and bottom-right corners. It does this by finding bounds on the region in the x- and y-axes, respectively. The beginning of the region is generally darker than rest of the image, so it starts by looking for dark, horizontal lines. Once it has found one, it assumes this is the top of the region and tries to find the left and right sides of the region 7. Once it has the top figured out as well as the left and right sides, it looks for lines containing blocks and for blank lines. Every time it finds one, it sets it as the bottom of the region. By the time its left the true region, there are no more of either type of line 8, so we don’t worry about false positives. The whole procedure takes 5 functions and ~80 lines of (C++) code 9. Fining the tile layout is less interesting. 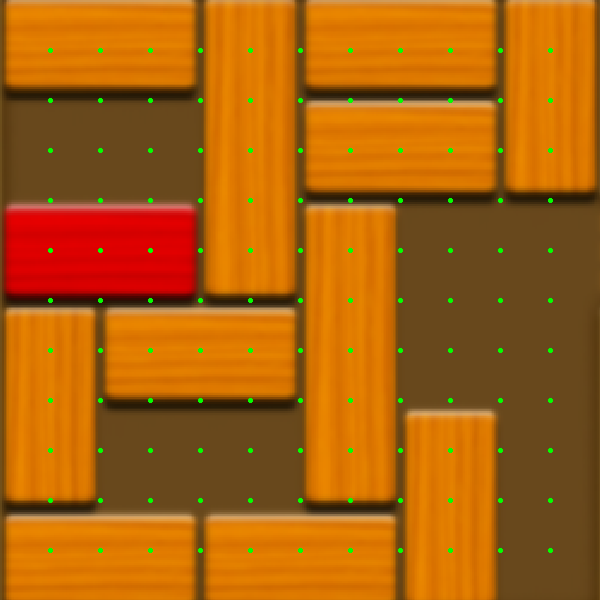 Pixel values at the green points in the above image tell you whether a location on the board is a tile, empty, or the boarder between two tiles 10. This information lets you reconstruct the scene. After that, A* gives you the shortest solution, and you’re done. so the program isn’t actually using a (helpful) heuristic at all 13. This means that it’s really performing a greedy best-first search and not (strictly) A* search, except that’s not the end of the story. The measure of goodness for a solution used by the program is the number of moves it takes, its length. That means the program always explores the potential solution with the shortest length which means that its actually performing a breadth-first search and not (strictly) best-first search 14. The program is coded as if its performing A* search even though its really doing breadth-first search, so it is less effecient than it could be 15. This was a fun little project. It started out as a means to solve puzzles, but looking back, the best part of it was writing the code to detect the game region. This was a fun task because there wasn’t an obvious solution when I started, and the solution I came up with was motivated/justified by exploring (looking at different pictures, testing different potential solutions, etc.). Multiplie times, I would get something working only to have it fail on the next image I tested it on, and have to adapt/replace it. In the end, I think what I have is adequate although far from perfect. One possibility that would be interesting to explore is training a neural network to detect the game region 16. The biggest issue I see with something like this is having to label who knows how many images of puzzle for the net to perform really well, although this issue can be somewhat alleviated by using something like Tensorflow for Poets.